Things are growing around here, including the grass, but Celia has given us all permission to let the grass grow under our feet so we can encourage dandelions, they are just what bees need. 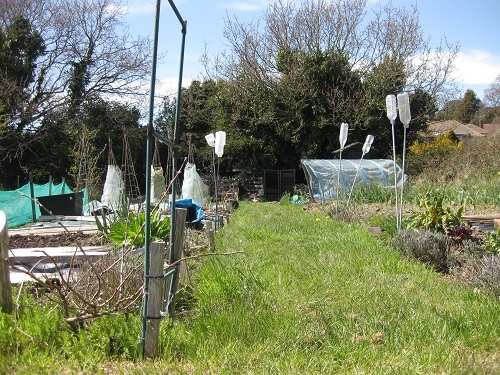 While I ignore the grass paths, I’m busy planting peas, potting on, spreading compost, building climbing frames – not the human kind but the plant kind. The sun has been out, things are generally warming up and yes the wind is still blowing. What else do you expect living and gardening so close to the sea? The shrouds you see are not the Turin kind, but the pea kind, to keep the pea plantlets nice and cosy while they settle into their new homes. I’ll be back later in the week to catch up with all the comments and my blog reading (I’m playing that juggling life game again, so sorry I haven’t been around as much lately but we’ll get there). Next Post Next post: All aboard the walking bus! I’m looking forward to your next post already. I’ll bring a flask and some homemade rhubarb cake to share… and if the sun is out I’ll be wearing strappy sandals! Perfect! Do you have the recipe to share ? I’m so not going there with the comfy shoes gag! Are you around for May Day? Yes…we move in to the flat on Friday…let me know if you’re in the area to come and help christen the flat! Yaay Kathryn is joining in on the fun, I just know we’ll have heaps to gawk and chat about! I’m intrigued Claire! Look forward to that post, and hope the wind drops a bit…. May I ask what purpose does the big plastic bottles has …. ???? You have really put some time and energy into this – wonderful – so looking forward what comes next. It seams like it’s cold winds all over North Europe … In Holland they have to use flowers from France for their flower festival. The wind is so cold, even if the sun is out and about. The bottles are so I don’t poke my eye out – accidently!! Looking forward to you joining in 🙂 and yes the wind still feels pretty chilly! Okay …. great idea .. *smile – upstairs for thinking and downstairs for dancing. It’s very cold over here too … poor nature. I am always amazing at how lush and green you are. I’ll where my crocs and be ready for the adventure!!! Crocs will be perfect for walking in a crocodile. Did you do that as kids? No, I’ve never heard of it. Is that a game? Walking in a crocodile meant walking two-by-two, imagine a group of school kids on an outing and to walk in a smart but sensible fashion we used to walk two-by-two, and as young kids would hold hands, it was always called walking in crocodile fashion! I’m looking forward to the stroll through your allotment. Definitely putting on comfy running shoes (trainers) that I can toss in the wash afterwards and bundling up cause the sunshine can be so deceptive and you end up freezing when the wind blows. And my thermos of coffee may be spiked with something warming as well. The sun, the garden, your magical green thumb – yay! I’m looking toward to your company!! Your peas are very lucky to get such care and attention! Looking forward to your special post… if I had stilettoes I would definitely wear them for the occasion! I’ll fess up – peas are a favourite and worth the effort. My, you have been busy, Claire. Those peas hit the jackpot ending up in your garden. You sure do spoil them! Looking forward to your surprise post and, no, I shan’t be wearing stilettoes, though that would be a surprise! I was planting too…but on a much smaller scale. 🙂 Just a few herbs and tomato seeds. I wish I have a bigger garden to plant peas. I’m loving the warmer weathers. Can’t wait to harvest time! A little patch of garden is precious, and planting herbs and tomatoes has to be a brilliant choice, where would we be without some freshly chopped herbs and some sun ripened tomatoes?! I meant to add that you can grow peas in a big bucket / pot, they look lovely! You have been busy Claire – looking forward to seeing more. Gosh, the cold brings so many extra chores in the garden. Still, I was watering my garden by hand and saving household water to add to that over summer. I suppose, short of a completely natural garden, there will be things to do. And that’s part of the pleasure. So true, I bet as a gardener I would still find things to do, no matter what kind of garden or what kind of weather! using household water is superb, well done on you. I have water bins up on the allotment and try and collect as much rainfall as possible, but at some point in the summer I’ll have to use tap water – but nothing beats natural rainfall, you can almost hear the plants grow after rain! A friend tells me one can’t ‘not grow’ things in England. I look forward to plants like that. Your peas are so cute, all bundled up. Things are just coming to life here and I think most of my new little trees survived the winter–hooray! I love spring! Isn’t it wonderful to start planting and getting outside Inger, it seems like such a long winter! Hey there, you sound like you are really in the rhythm of spring gardening. I can definitely relate to your comment about the wind still blowing! 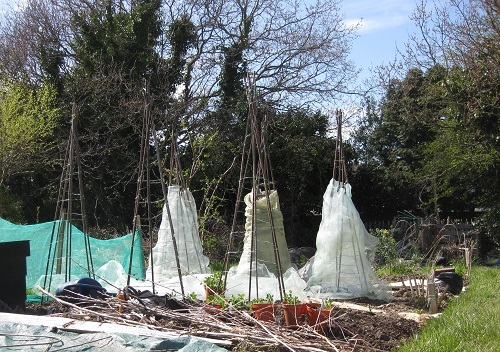 I also thought I was probably one of the only gardeners that wrapped the pea tee-pees with a protective cover but I see you do the same! I use floating row cover and kinda wrap it around them like a wrap-dress then secure it. It definitely keeps them happy as long as I get water to them! I think I can take it off now as it seems to have warmed up, but I still need to protect them from the sparrows as they love the peas too!! Isn’t it great swapping notes with other gardeners – I just love it! I love seeing your progress, and I adore the encouragement of dandelions! Looking forward to next week’s post! I’m beyond late too ! Oh well, c’est la vie !